For young Sören Anders, popularity came somehow over night when, at his first stint as a chef in the Oberländer Weinstube in Karlsruhe (closed as of May 1, 2013), he became the youngest Michelin-starred chef in Germany. Together with a certain non-conventionalism, both in his dishes and his outgoing sympathetic personality, press interest was naturally attracted. Anders deliberately selected some TV formats without being everywhere (now hosts a personal cooking show at the regional TV Baden), engaged himself for children’s nutrition and in this process he felt more and more uncomfortable with the rather traditional Weinstube environment. He looked for alternatives, found Klenerts auf dem Turmberg, a quite popular touristic restaurant on the Karlsruhe house mountain, started as a chef there in July 2012 and took over the whole establishment as of January 2013 and rebranded it as “Anders auf dem Tumberg”. Before that, he took some time off, managed to put together a financing for his new venture, and planned that the day-to-day restaurant, the brasserie, cross-subsidizes his Anders Superior, the small gourmet “corner”. Anders was trained by Sackmann, Thieltges and Bühner and this embraces both classic craftsmanship and modern techniques. Whereas he was unconventional when it comes to the combination of flavors, his cooking rests on a solid traditional basis, without drawing beautiful expressionistic pictures on his plates. 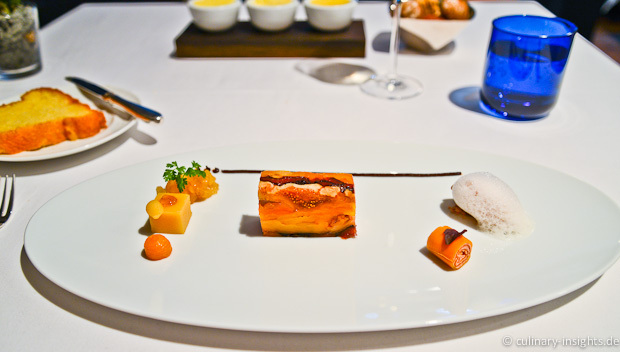 Compared to the time at the Weinstube, he managed to focus his dishes more on one interesting and thought-provoking dialogue of flavors so his cuisine became a bit more puristic and to the point. As before, one common theme is the reinterpretation of classic dishes in a new context, very often deconstructions of traditional desserts or German iconic dishes. 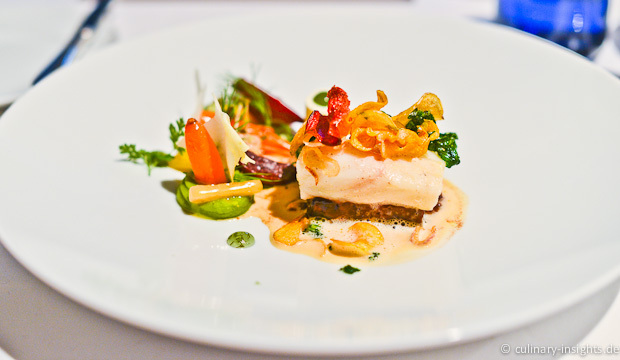 At the Anders Superior, he offers two menus at six or four courses (€119 for six, €109 for five and €99 for four courses) respectively, that can be also selected a la carte. As I am so bad at selecting something off the menu (I simply cannot decide) I let him choose and sat back to relax. It started with some nice nibbles served with a glass of sparkling wine from Baden (where are my notes?) – the matjes is a northern German specialty, quite delightful paired with some horseradish cream. The cornetto with beef tartar was a yummy short bite whereas the dough did not overpower the delicate beef. The “Strammer Max” is one of this German icons that Anders reinterpreted: a wonderful cream of baked ham served with an egg yolk and some bread crumbs on top – super! The first amuse was a real winner! An intense braised veal tail with some potato espuma shows that Anders is not afraid of strong aromas – indeed, the level of seasoning is always at the edge, but never crosses the border. A delicate property leaving the diner sustainably wowed – even after a couple of weeks you can still remember the sensory and flavor sensation. Remarkable. 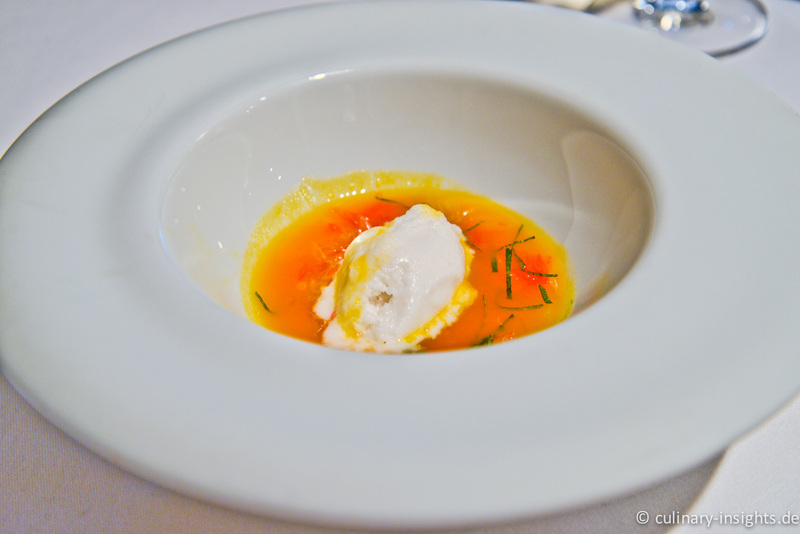 Next up was another example of sheer intensity, a crustacean soup very near to Juan Amador’s benchmark! However, the mussels stick did not add much as it turned out to be too crunchy leaving no room for the mussels to have an effect. The next course did remind me a bit of Bittner’s terrine of foie gras with some roasted elements in it (Bittner frequently uses roasted foie or mushrooms). Anders, integrated some dried fruits in a rather classic terrine but missed on providing some special suspense here – a little more dried fruits or some different texture would have elevated the dish, and he could elaborate around the gateau of roast apple showing more nuances of this very fitting note. Nevertheless, an intense pairing – very good. The langoustine was a clear step-up as the pairing with the cabbage (acidity) and ox bone marrow (earthyness) provided a broad, interesting and thought-provoking dish around a clear protagonist, the superb langoustine that could show all its versatility being served roasted, as tartar and as a carpaccio. Excellent! Very unusual combination and very Anders as he seems to love the land and sea theme. At first, I thought the ox cheek would be too dominant for then turbot but it turned out that its rather firm texture (due to its freshness) in combination with its roast flavors did make it a congenial partner with the land inhabitant. Together with some really carefully cooked vegetables, crunchy vegetable skin on top and a wonderful beurre blanc-like jus with mushrooms this was excellent to outstanding. 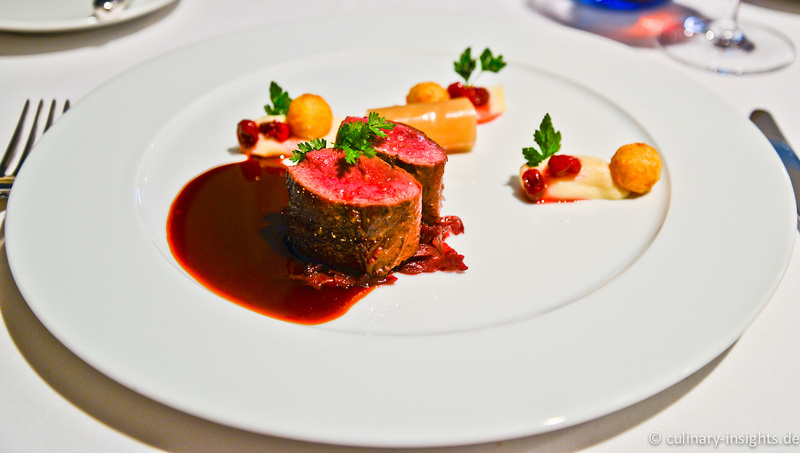 More classic for the main: the saddle of venison “Baden-Baden” is a dish rooted in Baden, the south-west part of Germany. Traditionally the venison was roasted in the oven covered by slices of bacon and served with pear halves, red currant jelly and Spätzle. Anders’ version was quite light and modern with some potato balls, red currants, pear jelly and an intense traditional venison sugo. Very tender venison from the local forest – very good to excellent! Very good and refreshing not too sweet pre-dessert! 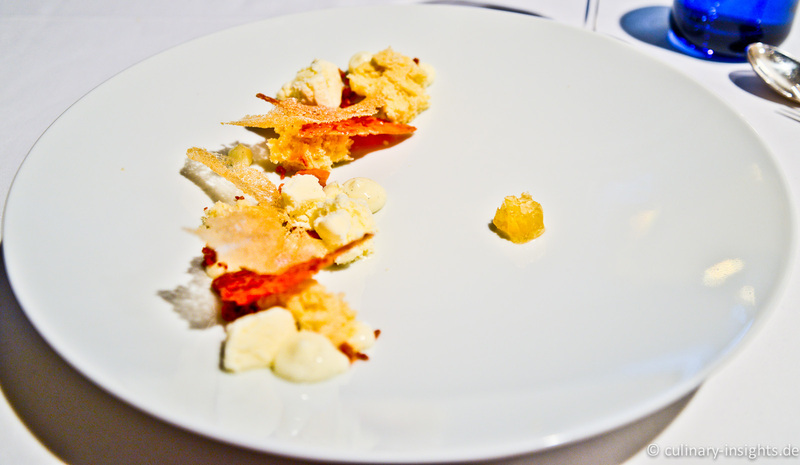 An typical Anders deconstruction that was clever, transparent and light – quite opposite to the traditional Bienenstich. However, the almond and honey elements were a bit too dominant for me – admittedly, I am not a big fan of Bienenstich anyway, but I liked this one much more the usual. Very good. The verdict: Overall, Anders’ team is doing a tremendous job – given the brasserie is almost always fully booked for lunch and diner and the demand for the gourmet outlet is also quite strong, the level in the Anders Superior is already very close to the quite high level demonstrated at the Weinstube. Anders deliberately cut put in effects and elements on the plate and is not serving 10 course menus any more. More is less here and the flavors a bit more to the point whereas some minor adjustments would benefit the cuisine. The very nice thing that everything what Anders does seems so easy and transports his passion for food. In this sense, he is positively ambitious. Anders is surely someone to watch – will be back for sure! 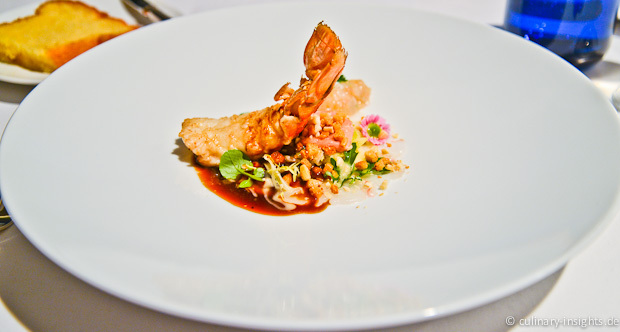 This entry was posted in Allgemein, Anders Superior, Europe, Germany - Fine Dining by IFS. Bookmark the permalink.